Hoera!! Hoera!! (That is dutch for ‘hooray’! or ‘Hurrah’!) 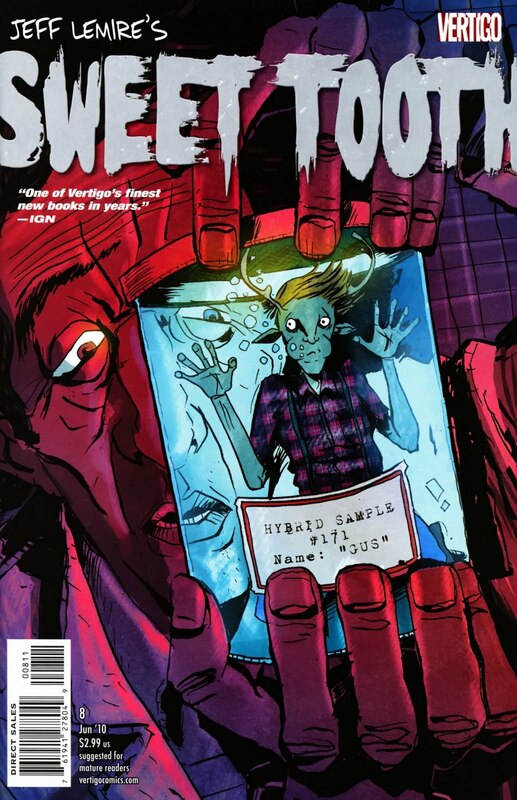 ‘Sweet Tooth’ has made it to a year – which, considering the recent news that both ‘Unknown Soldier’ and ‘Air’ have been cancelled, is something to still be grateful to Vertigo for. I don’t think the single issue sales for this title make happy reading, but the trade of volume 1 (aka ‘Out of the Woods’) did some good business on its release a few months back. Like so many other Veritgo titles, when they do not make money on the singles, they really cash in with the trades. But enough of sales and figures – we are at a lull in proceedings with the story at this issue, with Dr. Singh committing his surmising, thoughts and feelings to tape, and so provides a ‘jumping on’ point to try and grab the attention of more prospective readers. 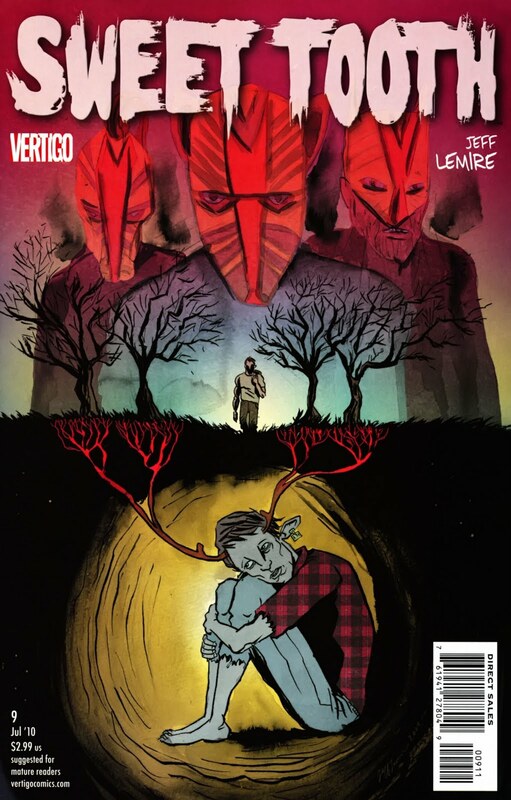 So, if you have not succumbed to the charm and emotion of this brilliant post-apocalyptic tale, please go and buy issue 12 right now! You have no excuse. And buy the first trade while you are at it. 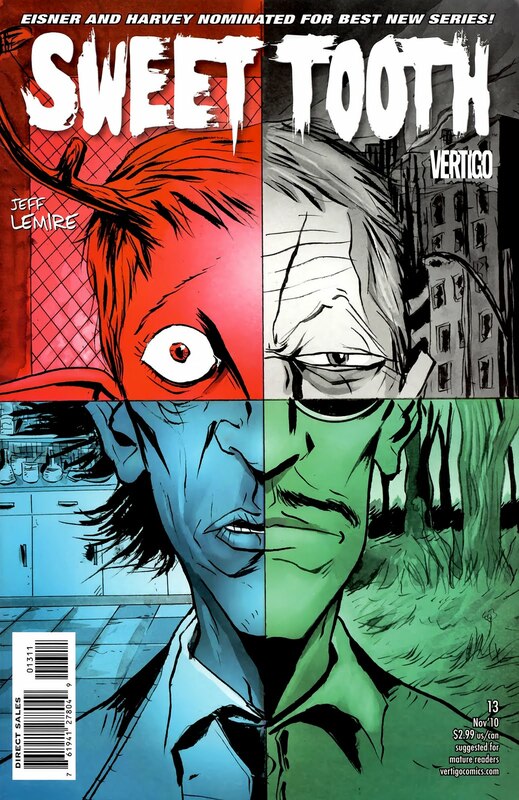 What Jeff Lemire (writer and artist) has constructed, as a narrative device in this issue, are panels devoid of any dialogue except for Singhs thoughts as text at the bottom of the panels. 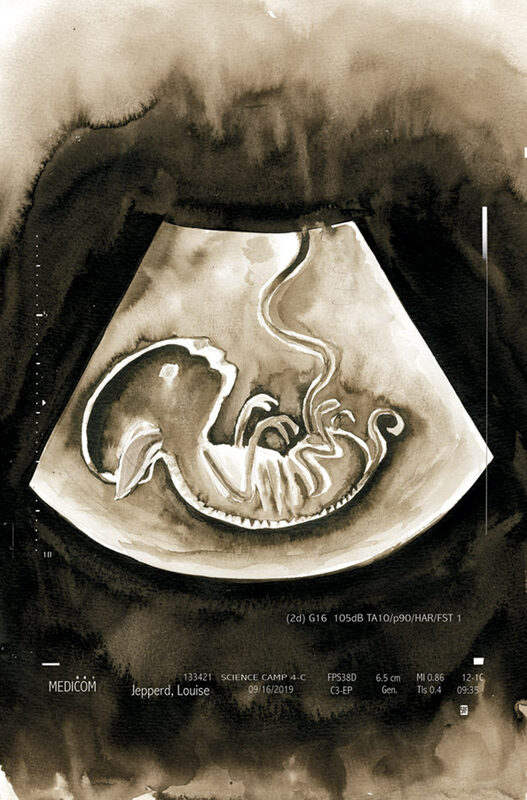 This allows Lemires wonky yet emotionally charged art to tell the tragic tale of Gus and the other animal-children hybrids, their fate inescapably entwined with that of the future of the human race. The brutality of the situation is made more hard to take because of the innocence / kindness of Gus, to his fellow captives. You are not allowed to forget that beyond their sometimes grotesque / funny appearance, these are children, helpless, incarcerated and very much at the centre of this drama. Issue 12 does not advance the story too much, but as a reference to where the story is right now, it does its job effectively. Does it work as a jumping on point? Yes Is there enough to keep established readers active? Yes. Oh, by the way – it has enough to spare for a heart thumping revelation at the end…. 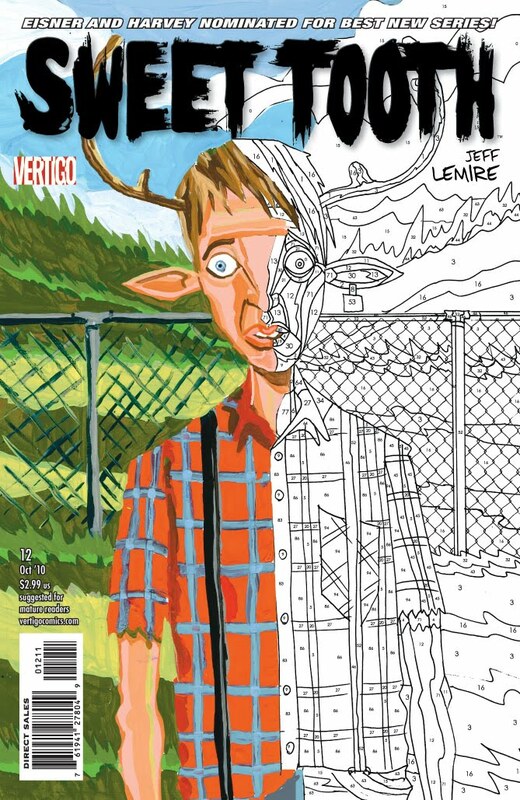 Another highly impressive, engrossing episode of Jeff Lemire’s post-apocalyptic opus. 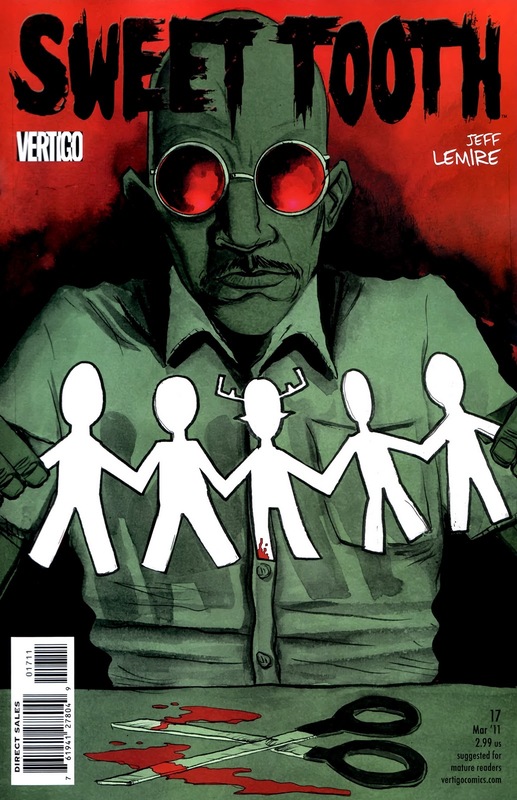 Here, he effortlessly interweaves the tales of Gus & Jepperd, as the reader gets a better understanding of the forces at work in this terrible world Lemire has conjured. 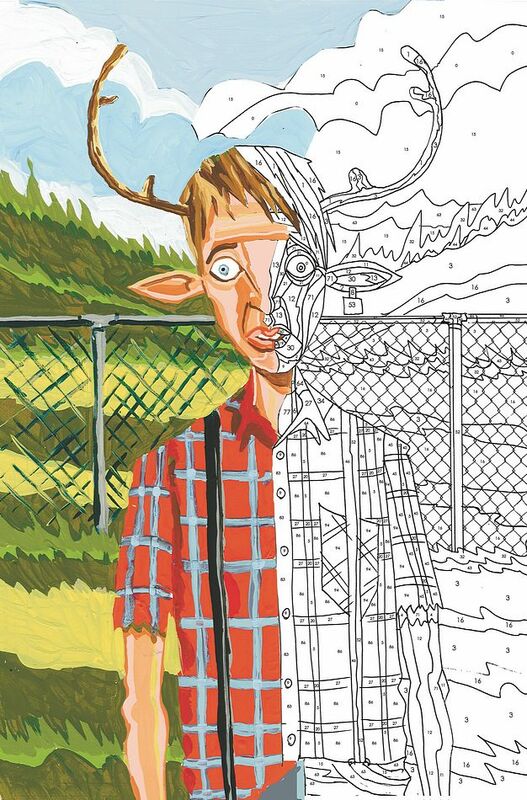 There is nothing but pure misery and sadness running coursing through this issue – Jepperd hell-bent on self destruction, lamenting his lost love, Gus terrified, confused and alone – but the power of these emotions is compelling. There is a lot more of this tale to be told. Nice Mad Max/ Akira tribute inside these marvelous pages as well. This title has not put a foot wrong, and as it heads into double figures, its power and intensity only increases. BUY THIS BOOK. IT WILL MAKE YOUR LIFE BETTER.